I’m located in Vienna, Virginia – a suburban area with a small-town feel, right outside Washington DC. I launched Janery 5 years ago as a part time business, while working in the corporate world. After the birth of my daughter in 2015, running Janery became my full time job, giving me more flexibility, less business travel, and time with my growing family. 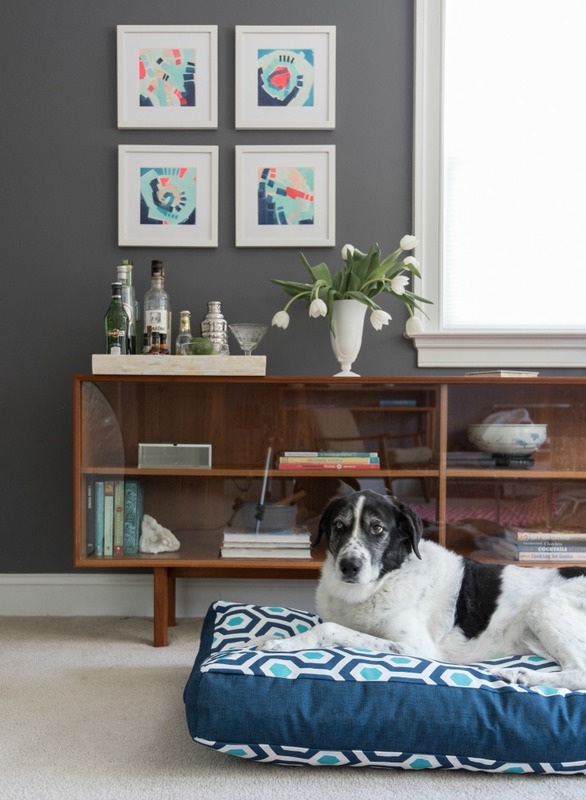 Janery’s pet beds help design-savvy pet owners spoil their pups with ridiculously chic beds that are durable and trendy, by using fabulous modern fabrics and American-made materials. 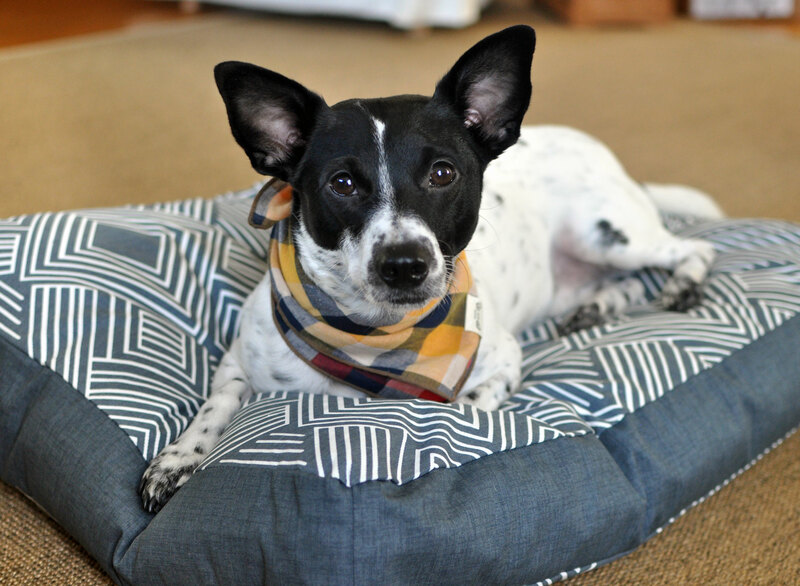 My pet beds withstand the mess of everyday life, are sweatshop-free, and keep your pup snoozing in stylish comfort for years to come. Charlie Cushion. Photo courtesy of Janery. I’m especially proud of my Charlie Cushions, the waterproof luxurious dog bed that started it all. 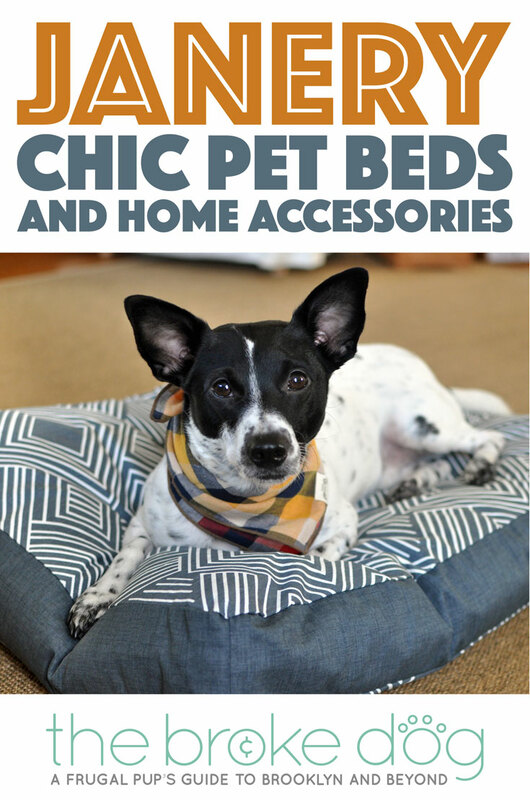 They’re fabulously high quality plush pet beds that combine style, function, and durability with 100% ethical American craftsmanship. Traditional pet beds are often drab and ugly, and more importantly, the plush inner cushion can be ruined by a simple accident. Putting the cushion through the wash make it lumpy with bare spots. Janery’s Charlie Cushion is built to last, with three layers: the plush cushion is overstuffed and channel sewn to prevent bare spots, the secret waterproof liner blocks allergens and dust mites, and the designer outer cover is tough and machine washable. Henry has a Charlie Cushion, and to say he LOVES it is an understatement! I’ve had a household of pets since my college days. My family has a happy little crew of two dogs and a cat. My senior dog Merlin is a Shepherd Husky mix that I found as a stray during my college days. (Sidenote, he could be Henry’s oversized Doppelganger!) Amber is a Standard Poodle who we adopted right before our daughter was born. I was, and always will be, a huge fan of mutts – but Amber has taught me how incredible Poodles are. My 13-year-old cat Aretha has been with me since she was 2 days old, but is so scared of the world that many people don’t even know I have a cat! I’m Jane, the creator of Janery. My past life includes careers as a violininst & teacher, a veterinary hospital manager, and a small business mentor in the defense contracting industry. I love pets, hiking, wine, travel, tree climbing, and food. I’m proud to say that as the business has grown, I’ve stayed true to these principles. Every year I donate a portion of Janery’s profits to local organizations helping homeless pets and people transition into permanent housing. Additionally, I source American-made supplies, and my pet bed inserts are made in small, family-owned factory in the US. I’ve got two tips! A simple one and a more detailed one. Simple tip: the best way to spoil your pet is to spend time with them outdoors. Skip the fenced yard time and take them for a walk, or better yet, a hike! Detailed tip: Please plan for, save for, and pay for your pet’s preventative veterinary care. An annual exam, bloodwork, vaccines, and deworming is not only important for their health, but also can save you money in the long run! In my past life as a veterinary technician and the hospital manager, I saw so many cases where a parent’s attempt to save money by avoiding preventative care ended up costing them money in the long run. Skip the Starbucks run and tuck a little money away each month to help defray the costs. PS: wondering why I said bloodwork? It helps you get a full picture of your pet’s health to spot hidden problems before they get worse. Henry snuggling on his Charlie Cushion! 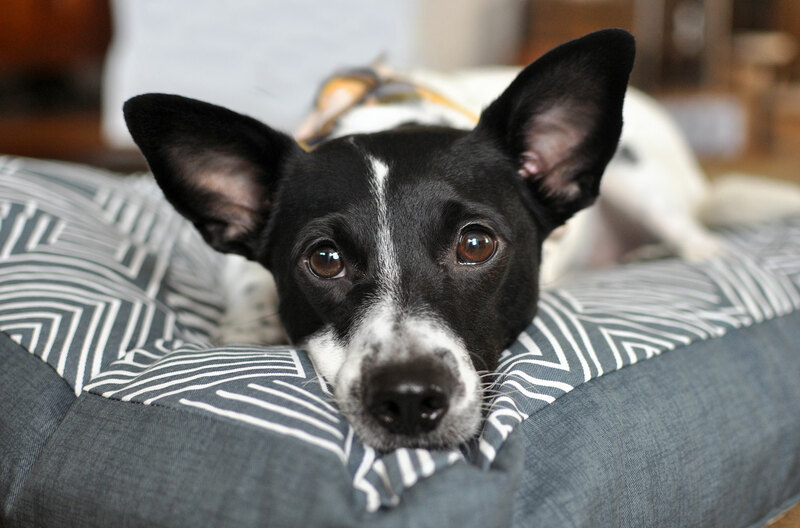 I lave what Janery is all about: gorgeous, locally-made, long-lasting products that pets love. Even Henry, who often dismisses dog beds for the comfort of my bed, loves his Charlie Cushion! I don’t blame him — it’s so deliciously soft and plush that I find myself wishing they came in human sizes. Visit Janery online, on Facebook, on Instagram, and on Pinterest! Use the Rafflecopter widget below to enter to win a $75 Janery store credit! Starts 12/16/16 at 12AM EST and ends 12/30/16 at 12AM EST. Open to adults ages 18+, international! we would love any of the charlie cushions! those are adorable! What cool products! If we won, we’d get a fancy new pet bed that we’d donate to our local shelter for pups to enjoy while they wait for their forever homes. i would probably get a large dog mat for my oldest dog to use in the car, on put on her bed, etc. they look really nice. i also love the herringbone bed design. love all the mats! the patterns and colors are beautiful! I’d get a dog bed or mat. I would get a new bed for my three dogs to share! We have three Coonhounds and three cats (all rescues). One thing we always need are more dog beds. I really like the Charlie Cushion in Mod Blue (also in Mod Red). I’d get one of those if I’m lucky enough to win. I would put the money towards the Charlie Cushion in Santa Fe Coral. It’s gorgeous! I would get another dog bed for our bedroom! I would love to buy the Charlie Cushion in Brown Herringbone. It looks comfy. I’d purchase my dachshund a new fluffy bed!! !